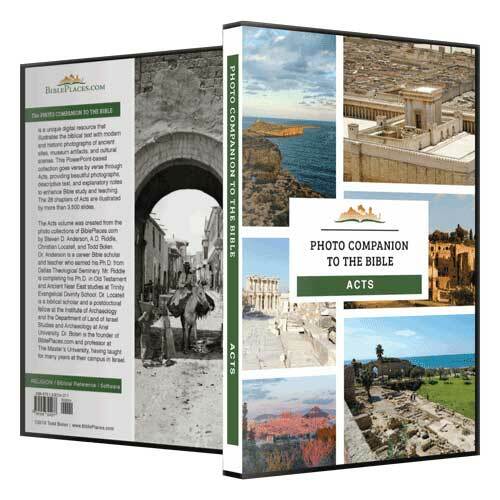 The new Photo Companion to the Bible, produced by Todd Bolen and BiblePlaces.com, is a wonderful resource for those who teach the Bible. The first set in this series of material was on the book of Ruth. Next came the Gospels. And now we have the book of Acts. There are more than 4000 images in this set on Acts. The images for each of the 28 chapters are included in a PowerPoint presentation with annotations explaining the image selection and background. I could say much more about the value of this collection of material, but I suggest you go immediately to the detailed information here. You will see samples of the work and ordering information. For a limited time you can get this material at a special sale price. Some of my friends are producing exciting videos to help Christians and other students of the Bible World to a fuller and more rewarding understanding of the region. Barry Britnell and Jeremy Dehut, along with the crew at Appian Media are producing some nice videos in Israel. These videos can be helpful to the person preparing for a trip, or for those who will never be able to go but want a deeper understanding of the Bible. Their first series was Following the Messiah, and now they are releasing Searching for a King (the period of the United Kingdom). I suggest you take a look at the new release here. If you have traveled with me over the past 50+ years (I am not the only one still alive from the first tour! ), you might like to help Wayne Stiles with his survey on how best to prepare and make the most of your tour. My friend, Wayne Stiles, has been helping people learn about the Bible World for a long time. He has a helpful blog – Wayne Stiles: Connecting the Bible and its Lands to Life. Several years back Wayne wrote a doctoral dissertation on the benefits of understanding and experiencing the historical geography of Israel. I found it most helpful in my own travels and the preparation of my travelers. He has also written some helpful books. On several occasions he has helped me with information I needed. Wayne is now making personal trips to Israel and producing videos year round. You can learn about his material at Walking the Bible Lands. Wayne is putting together a video series to help pilgrims better prepare for a Holy Land tour. If you have been to Israel before, will you give your advice by answering a few quick questions? Thanks in advance for your help! Click here: http://bit.ly/israel-tour-questions. And, if you promise to look at both of these sites (Appian Media and Walking the Bible Lands) I will give you one of my favorite photographs. 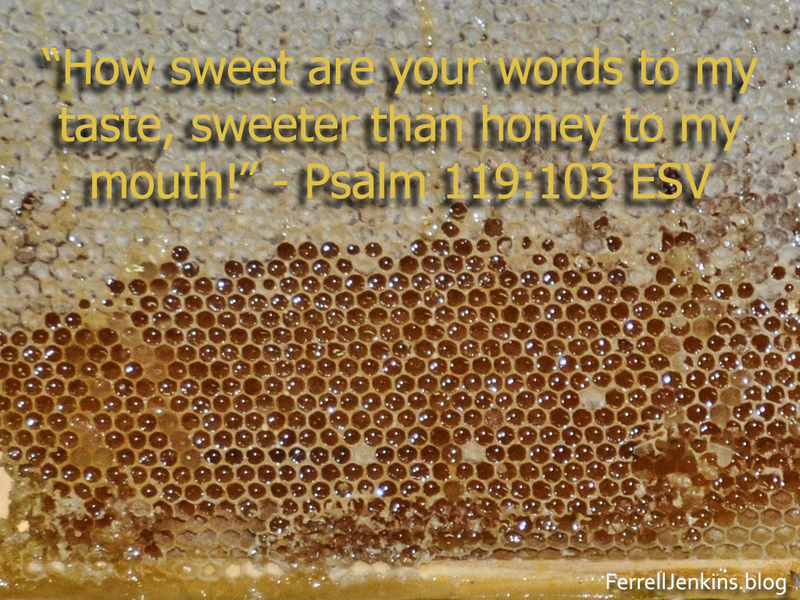 A breakfast honey comb at the Ron Beach Hotel on the west shore of the Sea of Galilee, Tiberias, Israel. Photo by Ferrell Jenkins. Since the late 7th century A.D. the site has been occupied by Moslem shrines, the Dome of the Rock and the Al Aksa Mosque. But this photo has more. Just above the middle of the photo is the Ophel which was originally built by King Jotham (2 Chronicles 27:3). In the bottom half of the picture is the City of David. It is bounded on the right (East) by the Kidron Valley, and on the left (West) by a road. It is shaped somewhat like a vase or bottle. 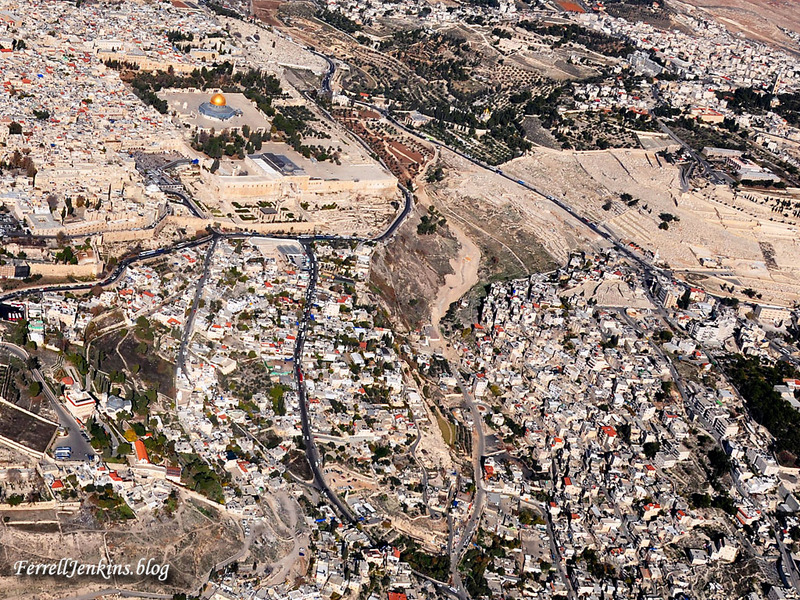 Aerial view of the Temple Mount, the Ophel, and the City of David. Photo by Ferrell Jenkins. To make this clear I am including the same photo with the areas I mentioned identified. The Mount of Olives is in the upper right hand corner of the photo. Aerial photo of the Temple Mount, the Ophel, and the City of David with identification. Photo by Ferrell Jenkins. It was an exciting day when I captured all of that in the same photo. You may be able to use it in your study and teaching. For more info see here. Persia is the only major country in the Bible Lands that I have not been able to visit. I was delighted when I learned that Todd Bolen, of BiblePlaces.com, had made such a trip. In his usual thorough way, Bolen has included all the sites one might need in teaching about Esther, Daniel, Ezra, Nehemiah, Cyrus, Darius, Xerxes, Artaxerxes, the return from Exile, and more! 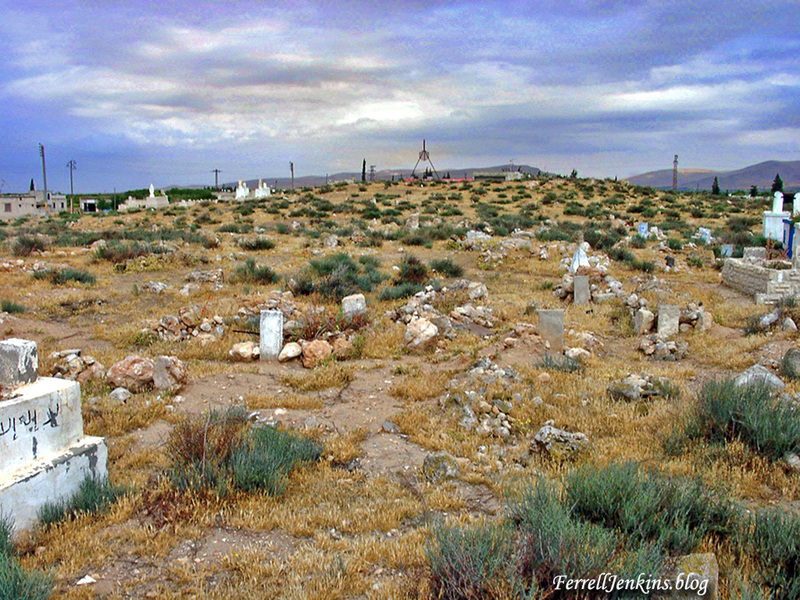 There are 1600 high-resolution images of historical sites and scenery in modern Iran. 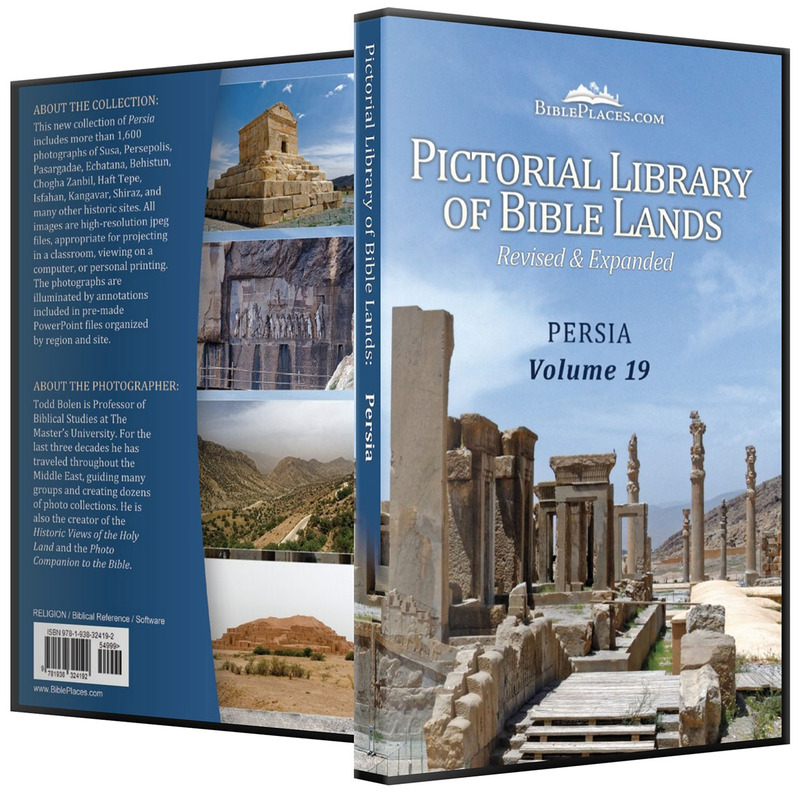 Persia – Volume 19 – in the Pictorial Library of Bible Lands. BiblePlaces.com is offering this Volume 19 of the Pictorial Library of Bible Lands for the introductory price of $25.00. You will have immediate download and also receive the DVD. In addition to ordering a copy for yourself, this is a wonderful gift to consider for some minister or Bible teacher. Even if they already have the Pictorial Library of Bible Lands, this is a new volume. Time is running out on this introductory price of $25.00. Go here for secure ordering info. I suggest you subscribe to the BiblePlaces Newsletter. Here is a link to the most recent issue which also includes more of the Persia photos. At the bottom of the page you will learn how to subscribe. By this time many people have heard the report on the news or read one of the numerous articles stating that a ring possibly belonging to Pontius Pilate, the Roman prefect or procurator who condemned Jesus to be crucified, has been found. The scholarly article on which the reports have been based has been published in Israel Exploration Journal 68:2 (2018). The popular article in The Times of Israel (here) includes a black and white photo of the area in the Herodium where the ring was found. I searched my photos and discovered a color picture I made of the same area in 2011. Even then some reconstructive work was underway. Photo of the Herodium made from the garden where the ring was discovered. Photo by Ferrell Jenkins in 2011. Our aerial photo below shows the Herodium in December, 2009. Additional excavations continue to be made on the north side of the artificial mound. The ancient fortress was hidden in the “cone” of the mound. 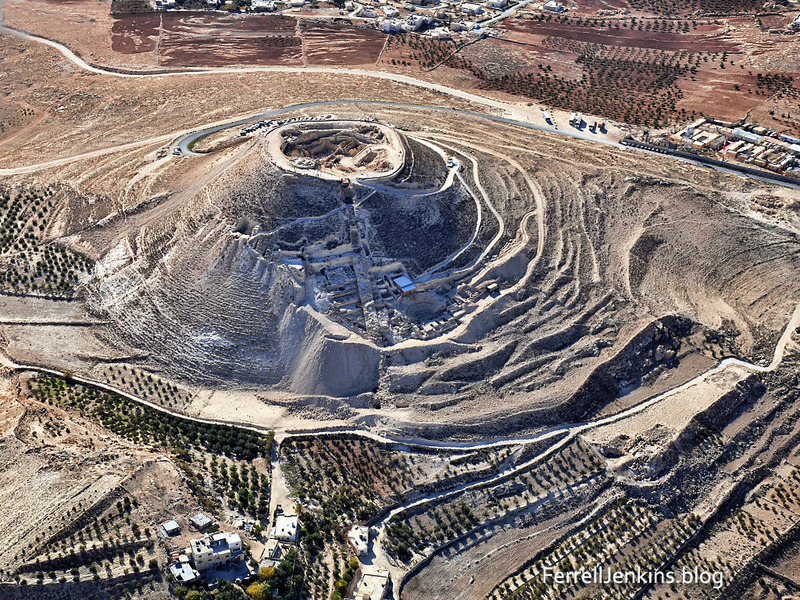 This aerial photo of the Herodium was made in 2009. 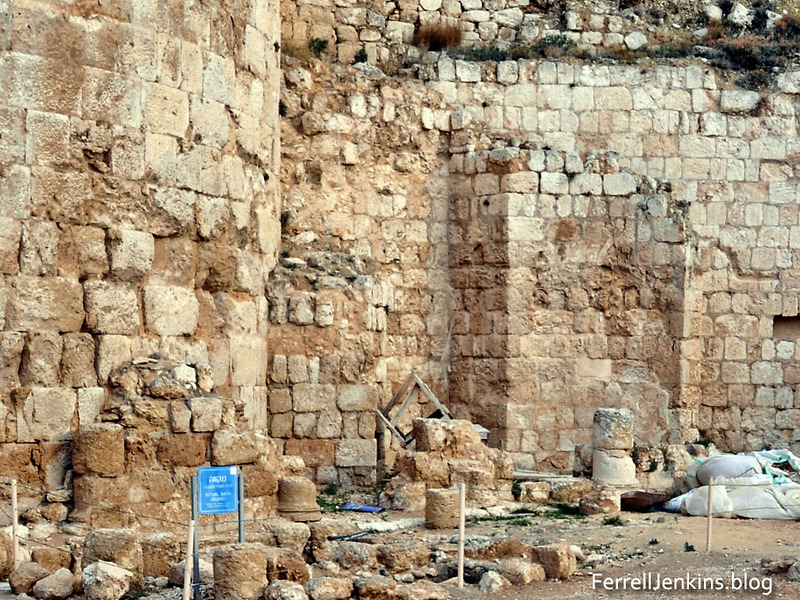 The ring was found in the garden inside the fortress built by Herod the Great. Photo by Ferrell Jenkins. This ring was found by Hebrew University professor Gideon Foerster during an excavation at the Herodium in 1968-9. Only now have scholars at Hebrew University been able to use modern photographic technology to read the inscription on the ring. The thin ring made of copper-alloy shows a krater with a Greek inscription around it. It reminds one of an ancient coin set in a ring. The krater was often used for mixing wine. Views and cross section of the ring discovered at Herodium. Drawing: J. Rodman; photo: C. Amit, IAA Photographic Department. I am not trained in things of this sort, but I immediately wondered about the spelling of the name Pilate. On the ring the Greek inscription is written as PILATO. I wondered why. Now comes the Bible History Daily written by Robert Cargill, editor of Biblical Archaeology Review. The ring discovered at Herodium is inscribed in Greek. And while Pilate minted several coins in Greek, he never placed his name on his coins, opting yet again to honor his benefactor, Tiberius, with the Greek inscription ΤΙΒΕΡΙΟΥ ΚΑΙϹΑΡΟϹ (Tiberiou Kaisaros; “of Tiberius Caesar”). 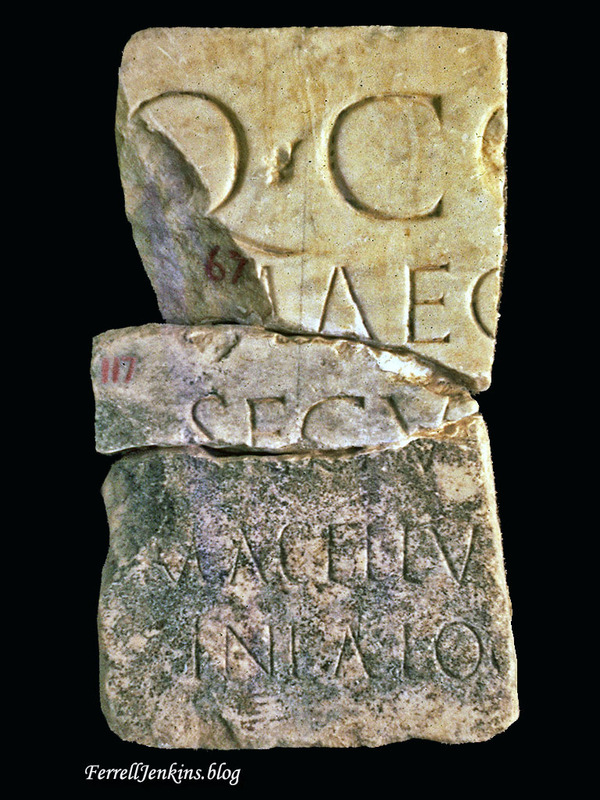 Here, Pilate inscribes Tiberius’s name using the Greek genitive, or possessive case, to indicate that the coin was minted during the rule and under the authority of the emperor Tiberius. …ΠΙΛΑΤΟ may be a Greek transliteration of the Latin dative form of the name Pilatus. You should be able to access Cargill’s article here. Prior to seeing his article I had already prepared a photo of the Pilate inscription discovered at Caesarea Maritima in 1961. 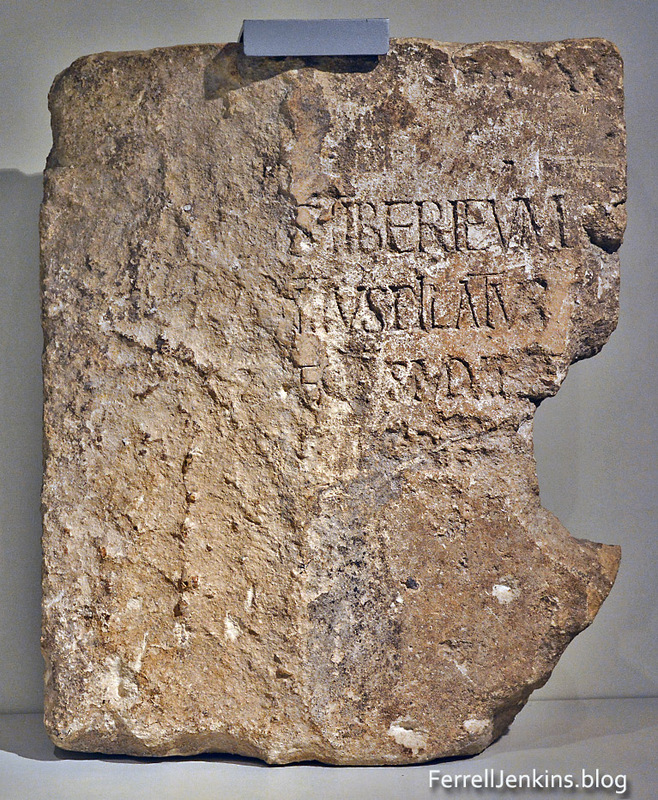 Pilate inscription discovered at Caesarea in 1961. Photo of the original in the Israel Museum. FerrellJenkins.blog. More than seven years ago I wrote about the discovery of this stone and the meaning of the inscription here and here. I like the suggestion made by editor Cargill, and his mention of sources of information we already have. …the Pilate Stone, hundreds of coins, Josephus, and the Bible itself—there really was a Roman governor in Judea at the time of Jesus named Pilate. To his list we should add Tacitus and other ancient sources. The most lengthy biblical account is in John 18:29–19:38, but Matthew, Mark, Luke, and Paul also make reference to the event. Be careful about jumping to conclusions after hearing or reading a brief report about discoveries like this. We have waited this long and we can wait a little longer while those trained in various fields evaluate the evidence.